What Is Dry Socket and Why Does It Occur? As part of the healing process after a tooth extraction, a blood clot forms to cover and protect the hole in your gums. If it doesn’t form properly or is dislodged, a dry socket will develop. Dry socket can be very painful because it exposes the nerves and bone under the gum tissue. It can also lead to a serious infection, so it requires care as soon as possible to prevent that. First, always follow a periodontist’s instructions exactly. It’s important to keep the area clean, but do so very carefully. Gently rinse out your mouth with salt water several times a day and also brush around the area twice a day (without getting your bristles directly into the socket). Your dentist may also give you a syringe to gently flush the extraction site directly. Don’t smoke or use a straw, as the suction can dislodge a blood clot. If dry socket does occur, it usually happens 3-4 days after your procedure. 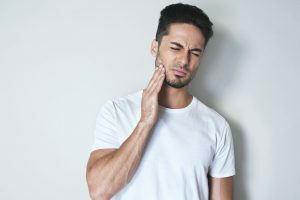 If you notice any symptoms such as throbbing, severe pain, lingering bad breath or an unpleasant taste, or if you can actually see exposed bone in the area, call a periodontist right away for an evaluation and possible treatment. Clean out the area to prevent infection and relieve pain. Place a medicated dressing in the socket (with instructions for when to remove it at home). After initial treatment, you’ll likely need to come back about a week later for an evaluation to make sure the area is healing well. Dry socket doesn’t happen very often, but when it does, it’s no fun. With these guidelines you’ll be able to prevent it or, if necessary, know when to get treatment! As a periodontist, Dr. Karl Lackler has become a leader in his field. He not only rated in the top 3% of the National Periodontal Board Exam, but also regularly lectures to dental professionals in the area. With his commitment to excellence, he’s able to provide his patients with an exceptional experience during a wide variety of procedures. If you have any other questions about dry socket or wisdom teeth extractions in Colorado Springs, he can be reached via his website or at (719) 574-4867.